President Obama, the most powerful man on earth likes taking things casual sometimes. When he visited his native home Kenya, everybody applauded when he dropped a sheng greeting…”hawayuni…niaje wasee?The dramatic introduction took social media by storm because nobody knew the most respected man would use such an informal greeting at an important business conference. Two years ago, POTUS, Danish Prime Minister Helle Thorning Schmidt and U.K. Prime Minister David Cameron decided to take a selfie at the Nelson Mandela memorial. The selfie stick is the current trend and everybody wants to have one. The long piece of metal with a camera at the end specifically designed to make it easier to take pictures of oneself will make a girl love you. Well, just saying. President Obama is a trendy guy. 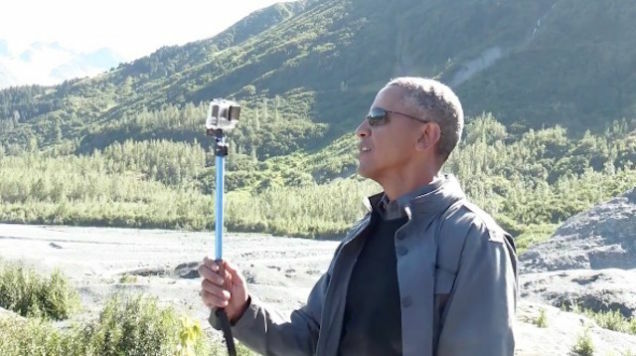 He took his selfie stick all the way to Alaska. Someone did a mistake giving POTUS the password to White House Twitter account and Instagram. The two social network accounts are currently very active since he has decided to upload all his selfies. POTUS posted a video on Twitter in which he describes the glaciers are receding and his own keenness to preserve what beauty we have. Global warming, he said, is occurring twice as fast in Alaska as in the bottom 48 states. This is a serious issue. Humanity has a tendency to ignore very dangerous things until it’s too late. Reports cnet. President Barack Obama headed to remote fly-in native villages of Alaska on Wednesday on a trip the White House hopes will bring attention to how climate change is affecting Americans. Obama is the first sitting U.S. president to visit a community north of the Arctic Circle when he flies into Kotzebue, an Arctic town of about 3,000 that is battling coastal erosion caused by rising seas. Obama visited a number of towns including Kotzebue and Dillingham, home to one of the world’s largest sockeye salmon fisheries, where residents are fighting the Pebble Mine copper and gold project that has been proposed by Northern Dynasty Minerals Ltd.
POTUS joined Twitter barely four months ago and he’s now an influential person. He identifies himself as Dad, husband, and 44th President of the United States. @POTUS has about 3.9Million followers. A very powerful man using a selfie stick to pass very important message on climate change, will make the selfie stick company obtain huge endorsements.